Vito "Babe" Parilli (born May 7, 1930) is a former American football player, a quarterback for 18 seasons in the National Football League and Canada in the 1950s, and the American Football League for all ten seasons in the 1960s. Born and raised in Rochester, Pennsylvania, an industrial town northwest of Pittsburgh, Parilli graduated from Rochester High School in 1948. He played college football at the University of Kentucky in Lexington, and was a quarterback for the Wildcats under head coach Paul "Bear" Bryant. 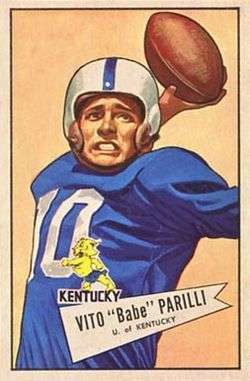 Parilli was a consensus All-American in 1950 and 1951 and was fourth in the Heisman Trophy voting in 1950, third in 1951. He led the Wildcats to victories in consecutive New Year's Day bowl games in the 1951 Sugar Bowl and 1952 Cotton Bowl. Parilli was the fourth overall selection of the 1952 NFL draft, taken by the Green Bay Packers. He played two seasons with the Packers, two with the Ottawa Rough Riders in Canada, one with the Cleveland Browns in 1956, two more with the Packers, and another with Ottawa in 1959. At age 30, Parilli was picked up by the Oakland Raiders of the fledgling American Football League on August 17, 1960, and threw for just over 1,000 yards that season. On April 4, 1961, he was part of a five-player trade that sent him to the Boston Patriots, and he went on to become one of the AFL's most productive and colorful players. Playing for the Patriots from 1961 through 1967, Parilli finished his career with over 25,000 total yards and 200 touchdowns, ending among the top five quarterbacks in 23 categories such as passing yards, passing touchdowns and rushing yards. Parilli was selected for three All-Star Games. In 1964, throwing primarily to Gino Cappelletti, Parilli amassed nearly 3,500 yards passing with 31 touchdowns; the latter was a Patriots record until Tom Brady broke it in 2007. During that season's contest against the Oakland Raiders on October 16, he threw for 422 yards and four touchdown passes in a 43–43 tie. Parilli is a member of the Patriots All-1960s (AFL) Team. Parilli completed his career with the New York Jets, where he earned a ring as Joe Namath's backup in Super Bowl III, when the Jets stunned the Baltimore Colts by a 16–7 score. Coincidentally, this gave the Jets two quarterbacks from Pennsylvania's Beaver County, with Parilli being from Rochester and Namath being from nearby Beaver Falls and both played for "Bear" Bryant in college, Namath at Alabama. In 1967, it was discovered by Life magazine that Parilli and several other professional athletes were regular patrons of Patriarca crime family mobster Arthur Ventola's major fencing operation called Arthur's Farm in Revere, Massachusetts. Despite the organized crime connection, journalist Howie Carr stated that there was never any inside information passed between Parilli and Ventola. Arthur was the uncle of mob associate Richard Castucci. Besides his considerable skills as a quarterback, he was one of the best holders in the history of football and was nicknamed "gold-finger" as a result of kicker Jim Turner's then-record 145 points kicked in 1968 (plus another 19 points in the play-offs and in Super Bowl III). He is one of only twenty players who were in the American Football League for its entire ten-year existence, and is a member of the University of Kentucky Athletic Hall of Fame. In 1982 Parilli was named to the College Football Hall of Fame. Because of their Italian surnames, the Patriots' wide receiver-quarterback duo of Cappelletti and Parilli was nicknamed "Grand Opera." Parilli retired as a player at age 40 in August 1970. In 1974, Parilli became the head coach of the New York Stars of the World Football League. The next year he coached another WFL team, the Chicago Winds. He later coached the New England Steamrollers, Denver Dynamite, Charlotte Rage, Las Vegas Sting, Anaheim Piranhas and Florida Bobcats of the Arena Football League. Parilli was elected to the College Football Hall of Fame in 1982. On November 15, 2014, he was inducted into the National Italian American Sports Hall of Fame. ↑ "Parilli joins Oakland Raiders". Pittsburgh Press. UPI. August 17, 1960. p. 45. ↑ "Parilli is swapped to Boston Patriots". Milwaukee Journal. press dispatches. April 6, 1961. p. 14, part 2. ↑ "Oakland trades Parilli to Patriots". Reading Eagle. Pennsylvania. Associated Press. April 5, 1961. p. 47. ↑ "Babe Parilli retires from pro football". Daytona Beach Morning Journal. Florida. Associated Press. August 30, 1970. p. 1C. ↑ "Babe Parilli". arenafan.com. Retrieved December 19, 2014. ↑ "Parilli, Meredith among hall of fame inductees". Gadsden Times. Alabama. Associated Press. February 7, 1982. p. 39.